Trendsetters to Trendsetters® magazine (T2T), is a national digital and print publication that launched in 2007. Our mission is to share with our audience, the knowledge, talent, and success of upcoming and established trendsetters and game changers, in order to inspire, educate, support, and produce positive mindsets and motivated populations within our communities. Our goal is to spotlight individuals that are making a positive difference among the masses, and to honor unsung heroes in our society. 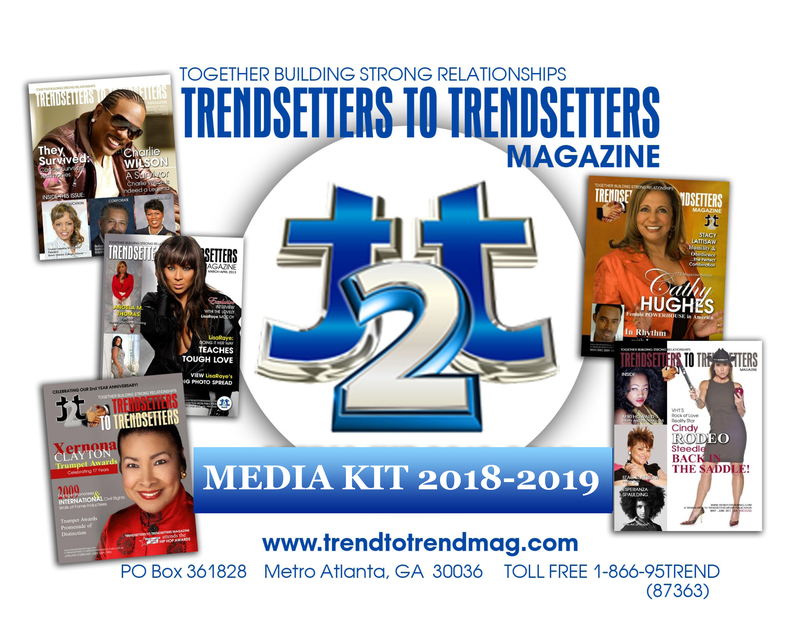 T2T Magazine contains only positive and informative material, and provides a strong network and meeting place for trendsetters across the country; hence trendsetters in Atlanta can meet trendsetters in Phoenix; trendsetters in Chicago can meet trendsetters in Houston; trendsetters in Cleveland can meet trendsetters in Miami; trendsetters in New York can meet trendsetters in Los Angeles; and so on. T2T magazine was created for the young, as well as the young at heart. We reach nearly a million homes and businesses bi-monthly. Our publication is not only a media magnet for affluent movers and shakers across America, but also a platform for everyone to learn, aspire and advance. The scope of our magazine is to showcase individuals and companies of influential character and excellence, while encompasses every market angle. Whether business, entertainment, education, or health; advertising in T2T Magazine endorses your support across all markets. Trendsetters to Trendsetters Media Group, Inc.